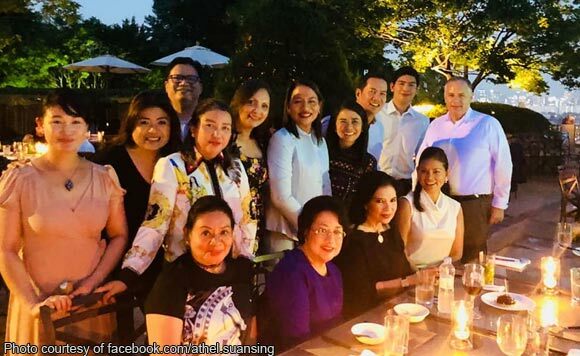 Nueva Ecija 1st District Representative Estrellita “Ging” Suansing was able to eat dinner together with Philippine Ambassador to South Korea Raul Hernandez. Suansing was among the politikos invited to the at the Grand Hyatt Hotel. “Cocktails and sit-down dinner last night at the poolside of Grand Hyatt Hotel with His Excellency Raul Hernandez, Philippine Ambassador to South Korea, with his wife and son hosted by General Manager Adrian of Grand Hyatt Korea,” said Suansing. “Thank you for the wonderful evening!” she added.